Climb aboard and let us do the driving as you enjoy the beautiful Copper River Valley! Your local driver-guide will point out the highlights of the area and answer questions as you pass through the farming community of Kenny Lake and the historic town of Chitina. From there the road enters the Wrangell St Elias National Park and follows the path of the Copper River & Northwestern Railway—nicknamed the “Can’t Run and Never Will.” Remnants of the railroad can be seen along the way. You’ll stop at the Kuskulana Bridge—a 525′ steel bridge built in 1911 that spans the 283′ deep gorge of the Kuskulana River and is still used today. Stop at the impressive Gilahina River bridge—very large wooden trestle, most of which is still standing but most definitely not in use. The 60 miles of road from Chitina are gravel and sit directly on the old railroad bed. 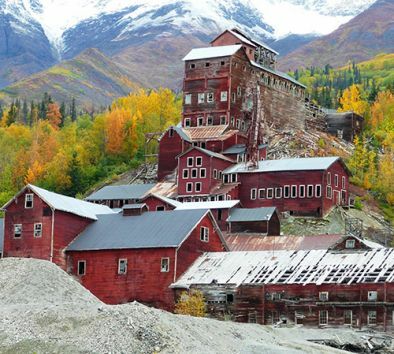 At the end of the road, you will get off at the footbridge with tickets to catch the McCarthy bus that will take you to the final 4½ miles into the historic mill town of Kennicott. You’ll have approximately five hours on your own to explore the area so make sure you visit the Kennicott Visitor Center and speak with a local Ranger! Wear comfortable walking shoes. Dress in warm layers. You will have 5 hours to explore at your leisure. The 60-mile McCarthy Road is rough in spots and is not meant for guests with back issues. Delays due to road condition are unlikely but possible. Lunch and optional recreational activities (i.e. guided hiking tours) can be purchased in Kennicott at your own expense. After Labor Day, shopping and dining venues may be limited. Travel time is approximately 3½ hours each way. Activity level: Moderate.